We are developing a date ranger picker and are in doubt how to present preset time periods. The scenario is this: EITHER the user utilizes a preset period, e.g. How is the OR functionality best represented in the user interface? In the picture above the "Setting alpha" etc. are just there to show the date ranger picker in context of other controls. Should choosing a date preset automatically fill in the From and To fields below the preset dropdown? And if not: How do you convey to the user what e.g. "latest 3 months" means in terms of exact start date? Should the non-selected option be greyed out and reset? And if so, should the non-selected field become active when clicking on not only the corresponding radio button but also the input fields, e.g. 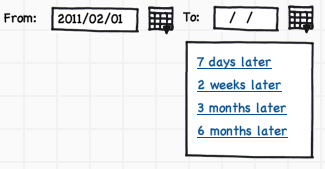 the dropdown or the date fields? What is your take on this? Which alternative do you prefer - or do you have any better suggestions? Do you have any good examples of how to present presets to users? In that order: B (with the handling detailed below), A (spelled it out), C.
C is for me the "typical techie solution": you first decide how to specify the duration, then you specify the data required for that algorithm. However, it's just two additional controls to manage, and the users don't know the options ahead. That said, if your users are techies / analytical thinkers, and it's easiest to implement, go for it. 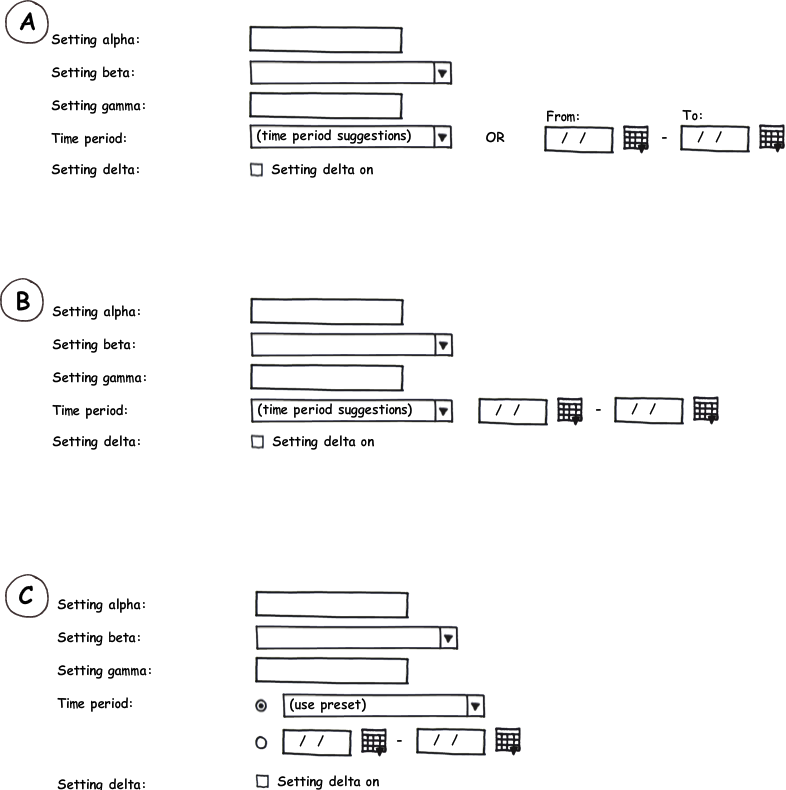 changing the range controls changes the preselection to "other"
when the user select "other" manually, show a hint like "slelect start and end date here"
Instead of "other", generate suitable textual representations (e.g. "next 17 days"). If the app is used mostly by regular frequent users (few casuals), consider a free text input like Hisham suggested: clicking around to enter three timespans in a given day is fine, for entering 30 in an hour is a pain, and free text wins. I'd omit the "from" purely for clean look, but there's a tradeoff. I generally try to give controls an equal size, and line them up on few lines to avoid a "restless form" look. Replace the presets popup menu with a simple edit field that lets users type, e.g. "7 days" or "7d". This is a little bit more work because you need to allow users to abbreviate and yet parse intelligently, but it's worthwhile the effort, I think. Drop the radio buttons; it's no longer an "either or" proposition. Have the edit field update automatically when the user makes a selection on the date pickers. And vice versa: update the date pickers' values automatically when the user enters a new value in the edit field. Change the label "Time period" to "Duration". Add a couple of extra labels here in there (From, To, etc). Have you considered doing it the way 37 Signals solve it in their applications? Single select field with options being "Next 3 days", "Next 7 days" and so on and then last option being "Custom range" (microcopy is not my strong side here, I admit, sounds a bit too technical) - checking the last option would show the datepicker fields. And when they select custom the datepickers appear. I would go with the B version because the time period and selectable from - to dates are connected, e.g. if you change the time period, the from and to dates will be updated, and vice versa - if you change the the from - to dates the time period will be updated. Version A seems odd since the time period and from to dates are the same, so an "or" between breaks logic. Version C has an unnecessary selector since you don't have to choose in what manner you will enter the time span, both will update both. I don't like the idea of having two different kinds of input fields to manipulate the same data. I think that would be confusing. Do I need to select something in the range selector AND both date fields? What happens if I set the date in the date fields manually and the check out the range selector out of curiosity? Does it still work if I select a range first and than change one of the dates? Is the other one changed to fit the range? All of that is not really obvious from any of the UI ideas. Having the ranges as links instead of a form field at least makes it clear, which of the entered data counts in the end. Not the answer you're looking for? Browse other questions tagged interaction-design dates or ask your own question. When are you giving the user too many options to choose from? What's the best way to present date of birth form fields? 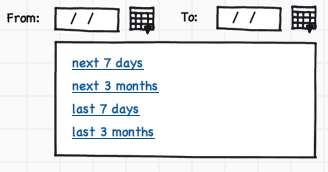 How to design a good one-line date picker?